The crochet posts are usually not called air. The name are loop. The columns in this form of needlework come in many different types: without nakida, with nakida (two, three), a lush, relief crossed. Most aerial views have columns with nakida, not very tight. Dial a chain of air loops. Throw on your hook and thread, holding it with his left hand. Back to four loop back and enter the hook in the chain. Hook the thread and pull it out. Now provarite in two steps: first, last, loop and yo, then the resulting two loops. Vivacite air loop and proceed to the next column with nakida. To obtain a pattern in the form of a rectangle, enter the hook not in the loop, and through one. As a result, the poles and loops to form a neat square. This knit is called the loin. It is usually used for summer clothing where necessary elements from the grid. Make the necessary number of turns of thread around the hook (two, three, etc.) for columns with the appropriate number of nakido. Knitting is similar: in each reception promazyvaetsya one loop and yo. That is, the more rpm was made, the longer fit in the column, and the higher it is. Explore the lush bar. This technique is suitable for knitting hats, scarves and other elements, where the desired convex parts that form the airbag. Throw the hook thread, type it in previous row and pull up a loop to the desired height of the future column. Repeat 3-7 times, until the desired flamboyance. Provarite all elongated loop at a time and fix the air loop. Use openwork binding to create the effect of lightness. 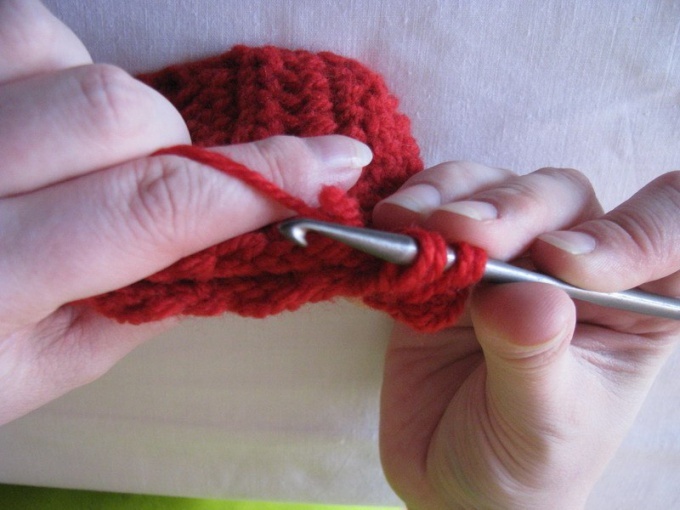 Often used for this purpose bars, knitted by a group from the same loop of the previous row. They can be plain or with different numbers of nakido. They have in common is that after the end of the column, the hook is again entered into the same loop. The number of items of the same base depends on the requirements of the scheme of knitting. Apply relief columns for air, chunky knit. To create them, the hook will not lower at the loop base, and they go around the column of the previous row. Pull the string and run the column with the desired number of nakido. These elements of the knitting will look concave and convex depending on how you insert the hook in the bottom row. If the thread is held in the front of the column will be ahead, and if behind - sink back. Turn in the air ornament the crossed bars. Hook with two brides enter into the loop of the bottom row and create a regular column with one nakida. Add on the hook for another yo and missed one loop in the base, proverite all the loops in pairs in four ways. If air loop and associate the new column with nakida from the place of crossing knitting.